This property is new to vrbo and has undergone an entire transformation. 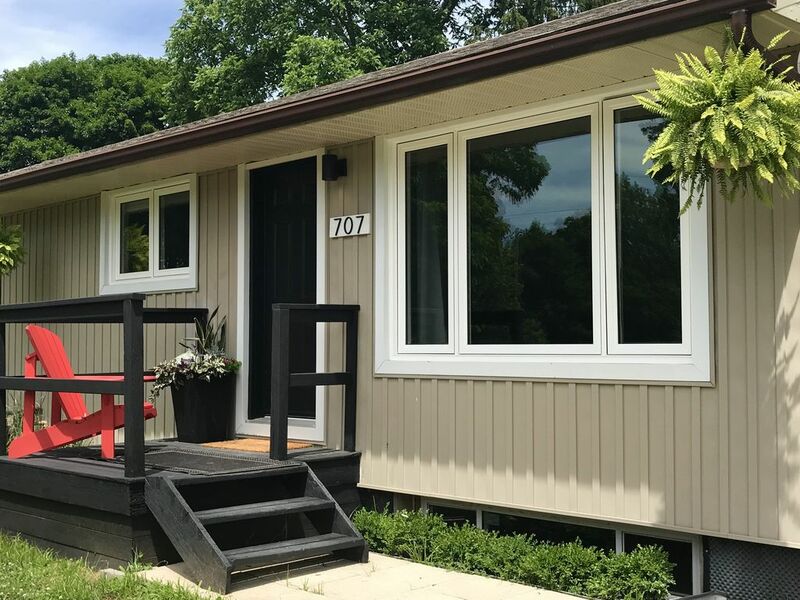 With 1100 square feet, it boasts a full kitchen backing onto a beautiful country yard. The master bedroom is complete with ensuite bathroom and water closet. Both bedrooms are equipped with king sized beds. It is the ultimate destination to getaway from it all... in the heart of a little town Fenwick, Pelham, Ontario, Canada. VERY clean. Had everything we needed - fully stocked kitchen, lovely bathrooms, spacious bedrooms, nice decor. Vanessa very easy to work with. We enjoyed our stay! The unit was very clean and well appointed. My family felt very comfortable and at home. Bright and beautiful home. This was the perfect location for our weekend getaway to the Niagara region. Comfortable king size beds. Each room has their own bathrooms. Lots of space for the four of us to relax. So much better than a stuffy hotel room. Vanessa was a wonderful host and gave us great tips on winery's and places to eat. We can't wait to return! The place was in great condition. Beautifully kept and very spacious. We wanted to get away from the city and this proved to be a great option. Thanks for the stay. My Daughter and I stayed for a week. Not only is it clean and gorgeously decorated. It felt safe and homey. I loved the back deck where I had my coffee in the morning and relaxed after dinner. It is perfectly located. We had many day trips into Niagara and St. Catherine's. Dinned around the corner at Broken Gavel. It was incredible. Vanessa is warm and welcoming and is available right away if there are any issues. The beds are comfortable and the linen and towels were plush. I plan on booking this again in the fall for a get away with a bunch of girl friends! We stayed here for two nights. The house was clean, comfortable and had a spacious floor plan for a two bedroom home. It was definitely large enough for the three of us and could easily accommodate two couples. We especially enjoyed the back deck with the adirondack chairs where we had coffee both mornings.